Born and raised in Germany‘s small town Gera, Dana Ruh soon found her way to the capital city Berlin. Besides her daytime job she got herself into the beat and sound of the vibrating music scene where she started her steadily rising career as a DJ in 2005. Since then she experimented with electronic, house and techno music to find her own incomparable sound. 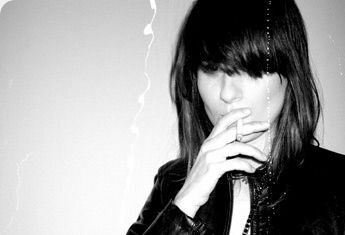 Not only her DJing got her more and more into bigger venues, also her musical output as a producer let her to regular releases on labels like Einmaleins und Ripperton‘s Perspectiv. She also contributed remixes to the swiss Label Mina Records, the danish Connect Four and american Clink Records. That led to a wider attention in the european and overseas techno market and strengthened her name as an german artist, which from that point on could not be disregarded. Above all this she founded in 2007 her own record label Brouqade together with a friend. The two ladies intended to completely devote their long-lived experience within the realms of djing & producing and urban nightlife to the release of electronic music in the soundspectrum of,clear Techno and House. Brouqade Records also featured videos of their artist‘s tracks which have been well recognized on respective plattforms. All her forthcomin‘ EPs were released on that label and new talents such as Danilo Schneider and Benjamin Fehr were featured as well. Her own musical development ushered her to new collaborations with well-known DJs. In 2010 she produced together with Cocoon‘s André Galuzzi for Ostgut Ton in Berlin. The EP „Mauersegler“ cracked the dancefloors and tracks from that EP have been put on different compilations. Out of this work the both artist created there own record label Aras in early 2011 to build a plattform for their productive liaison and support new talents. Yet she has not hestitated to explore musical possibilities in her studio with her machines to continue her solo work. While evolving new sounds and tracks Dana Ruh hit some spectacular signings with Ben Watts‘ Buzzin‘ FLy and put a track on a Various Artists on Crosstown Rebels. As well there will be her own new releases on Aras and Brouqade. Make sure to expect some musical gemstones in the second half of 2011 to be released....Coz diamonds are that girl‘s best friends.